JUNE 2012. Frustrated by financial and marital turmoil, all I want is my life back on track. Instead, a sudden illness crashes my husband, Gordon, to the brink of death in a coma. Forced to embark on an epic journey, I confront my terror of abandonment, loss, and the unknown. In a race against time, family rifts, the unseen at play, epiphanies, bombshells, and the extraordinary spontaneous growth of a special online community all converge, as I discover how to heal a heart, love freely, and experience that which is never alone. 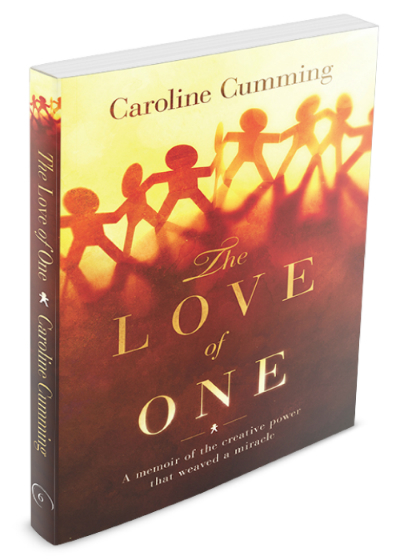 Part magical mystery, part awakening, part collective journal, The Love of One intimately explores how we create the suffering of disconnection and illuminates the possibilities when we are love in action. Raw, candid, and insightful, this story is for anyone struggling in life or relationships, or seeking inspiration on how to connect and receive from the richest depths of vulnerability and the heart. ‘’YOU DON’T READ THIS BOOK, YOU LIVE IT AND IN DOING SO YOU WILL CHERISH YOUR LOVED ONES ALL THE MORE.” – Anthony Peake, consciousness researcher, and author of The Infinite Mindfield. Barry Eaton, broadcaster & author of Afterlife and No Goodbyes. Anthony Peake, consciousness researcher, speaker, and author of The Infinite Mind: The Quest to Find the Gateway to Higher Consciousness. “Stunning prose…keeps you on the edge of your seat…journal of what healing our fearful stories looks like and requires to be achieved…and of the power we have as a community when we join together with love and compassion…I’d highly recommend this book to every client, friend and family member I know! For those seeking wisdom, personal clarity and answers, or experiencing upheaval or grief, it will be a godsend. For those who love in depth stories about people’s lives, it will simply be a joy. You will be changed and potentially transformed into a better version of yourself just by reading it”. Katie (Altham) Todd, psychotherapist and bestselling author of Who Am I? An Archetypal Quest. Dr Julie Mundy-Taylor, Senior Research Librarian, Newcastle University. Angie Quinn, therapist and life coach. Helen Gill, intuitive and healer. Get my 'Notes From the Eagles Nest' - my engaging weekly tales with actionable wisdom, to feel more alive and live your Love in action. As a new subscriber you'll also receive my fabulous FREE gift: Walking with Heart - a fun 4 week on-line adventure for opening to more magic on the path and in life.